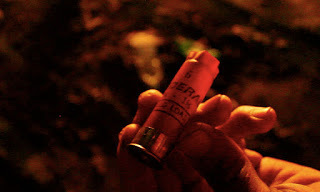 Apologies, this post is really just a place to dump a load of stuff – following a couple of requests, I thought it might be useful to post somewhere a round-up of arms and ammunition being used against protestors in Tahrir right now. There seem to be a growing number people in and around the Square angry at being fired on by weapons supplied from countries making nice noises about democracy and restraint in Egypt, and are starting to document markings and specifications of what’s being used. It won’t help stop any violence, but I’m generally in favour of causing a modicum of embarrassment to those governments and companies which continue to supply tools of repression, usually for profit, to those who they well know will use them to violate human rights and repress their own citizens. There are lots of good ID resources around – for the real afficionado of “less-lethal technologies”, you can’t beat Mispo (subscription only), which also has a live update stream of identified military/security equipment being used images from around the world. All the usual caveats, of course, apply below: the provenance of most of these photos can’t be definitively verified; and a given country of manufacture doesn’t indicate that that country’s government supplied the weapons to Egypt. I’ll try to update this as more info becomes available. 9mm Parabellum/Luger ammunition is designed for use by 9mm pistols (either single-shot or semi-automatic), or semi-automatic/automatic sub-machine guns like the MP5-series submachine guns with which some Egyptian security forces were photographed back in February. Right-hand cartridge case is a fired 9×19 round manufactured by Sellier & Bellot (Czech Republic). Not sure if ’10’ indicates a 2010 manufacture date, or a batch number (some S&B ammo doesn’t carry a manufacture date marking). Left-hand cartridge case is an unfired round, difficult to see the headstamp markings to determine their manufacture or age. I *think* it has a NATO (cross-in-circle) marking, indicating a NATO country of manufacture, but difficult to tell for sure. Most significantly, this *appears* to be ‘live’ ammunition (although we’d need to see the bullet – other end – of the unfired round to check 100% that it wasn’t a blank; and to see what kind of live ammo it was). I’ve so far seen one picture (undated, from – er – Russia Today) of a larger cartridge case with a ‘shoulder’ narrowing towards the end (unlike 9x19mm cartridge cases, which are straight in profile). These appear to be around the right size for assault rifles (they *look* a bit like 7.39 short for AKs, but it’s basically impossible to tell at this distance). 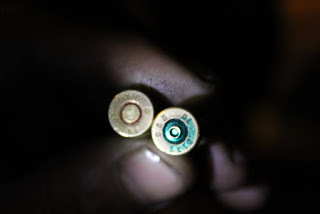 Again, these *don’t look like blanks* (which generally have characteristic ‘crimped’ necks), but it’s not possible to tell definitively whether these are ‘live’ rounds or not without examining the bullets or the cartridges. (There *is* ammunition of this kind produced with plastic or rubber bullets plus metal rifle cartridge cases, but it really isn’t at all common; and the rounds of this kind that do exist are more commonly 9mm rather than larger). Even if they *are* some kind of weird rifle-fired ‘rubber’ bullet (which personally I don’t think is likely): at this small calibre, with the inability to ‘skip fire’ them along the ground rather than direct-fire them, and with the energy that a rifle-sized round can produce, they are arguably likely to be dangerous. These can come in all sorts of varieties, lethal and ‘less-than-lethal’. Lead buckshot, rubber buckshot, other impact munitions, irritants, and all sorts of other weird things. quite a lot of pictures of 12 gauge rounds from Fiocchi Munizioni S.P.A. I *think* these ones are actually manufactured in Italy (there is also manufacturing capability at Fiocchi USA, but these tend to be marked ‘FIOCCHI 12 USA 12′). Once again, Italy-made doesn’t necessarily mean Italy-supplied. 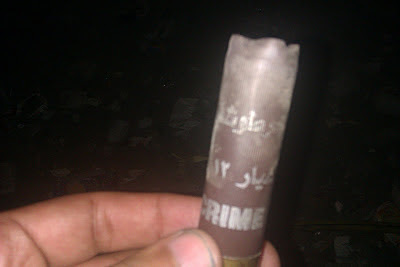 a 12 gauge round with either Arabic or Farsi markings – difficult to make out which. Marked ’12’ (presumably for 12-gauge calibre) in Eastern Arabic numerals, plus a symbol which *could* be that of Egypt’s domestic military production unit, the AOI. But that’s just a complete guess. (added 23 Nov 2011)“>Others have western numeral headstamps (’12 12′ denoting a 12 gauge round) but Arabic script on the cartridge body, including ‘عيار’ (shells). Another variety with a mix of Arabic and Roman script on the cartridge body e.g. pic below from @msheshtawy on 22 Nov) marked ‘CRIME’ (Roman letters) and what I *think* reads ‘خرطوشة’ (‘cartoosh’/ cartridge),’عيار’ (shells), and the numerals for ’12’ [gauge]. Also reportedly carries the word ‘مطاطية ‘ (made of rubber), so presumably containing rubber buckshot or other rubber impact munitions. Anyone with proper Arabic skills – help greatly appreciated! US-manufactured Federal Premium shells (below from @RiverDryFilm). Difficult to make out the ‘load’ markings which would indicate what kind of round it was. Likewise no date marking. I haven’t seen anything yet that isn’t standard ‘CS’ (2-chlorobenzalmalononitrile) – probably the most common form of ‘tear gas’ used around the world. There are obviously two main risks from tear gas: in an enclosed space concentrations can cause severe respiratory problems and even death; and the impact from tear gas canisters themselves (which are generally not safe to fire directly at people, rather than ‘skip-fired’ across the ground) can injure and kill. Also sighted are Federal Laboratories’ manufactured 560 CS and 570 CS rounds (different models for different ranges). 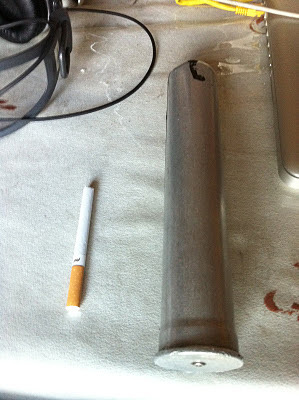 Longer silver-bodied, entirely unmarked cartridges – appear around 200mm long. Difficult to identify at this stage (there are various manufacturers of very long anti-riot rounds, mainly US and Chinese). Further pics of the example below (taken by @mikaminio 23 November), showing the primer, are here and here. 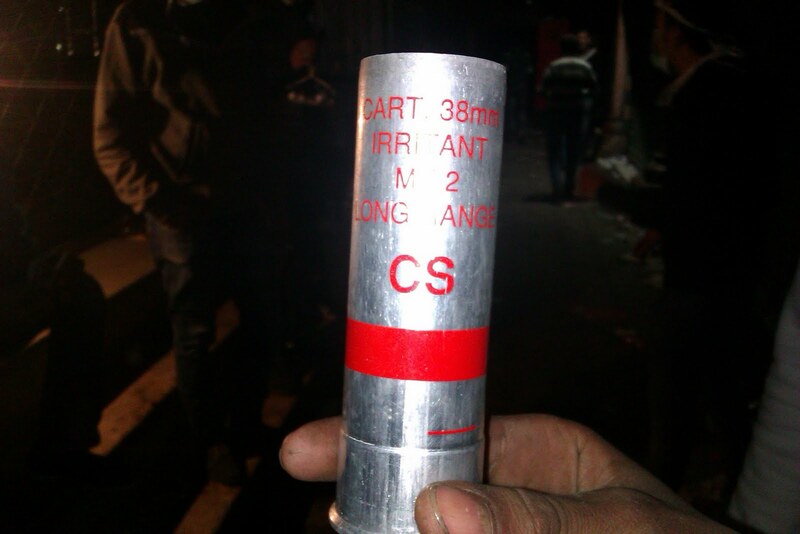 Red/silver 38mm CS cartridges reportedly marked “CART 38MM IRRITANT MK2 LONG RANGE CS”. (Below image from @msheshtawy, 22 Nov 2011). Still unidentified definitively – although the markings precisely match those of 38mm CS cartridges advertised by the United Kingdom’s Chemring Defence group, which incorporates former UK tear gas manufacturer PW Defence, the colouring is slightly different. Not clear how old (no lot number or manufacturer markings). Again, images of the headstamp/primer (on the base of the cartridge) could help positive identifications; and again, UK manufactured doesn’t mean UK supplied. Federal Laboratories CS rounds (this pic from @mmbilal, 22 Nov). Think this might be a weapon-fired Mk II 560 CS round, but can’t be sure from the picture. Definitely US-made, but could be comparatively old: Federal Laboratories are now part of US firm Defense Technology). There are also a few photos floating around of what appear to be rifle-fired fin-stabilised rounds – too big to be the rubber fin-stabilised rounds from 12 gauge specialty ammo. I’ve no idea where these are from, or what their properties are – would be good to know more. Sellier & Bellot (9mm ammunition) is a Czech firm, with two branches – Sellier & Bellot a.s. – the main company – and Sellier & Bellot Trade a.s. for trading operations. The latter has a lot of private investors, but the former was acquired in 2009 by the established Brazilian ammunition manufacturer Companhia Brazileira de Cartuchos (CBC). According to the Czech company registry, CBC owns Sellier & Bellot via a US company, CBC Ammo LLC, registered in the notorious tax haven of Delaware. CBC is itself apparently privately owned. Combined Systems Inc (tear gas) is majority-owned by New York private equity firm Point Lookout Capital Partners. At least some of its equity is held by the defence investment giant The Carlyle Group (via its Carlyle Mezzanine Partners fund), which debt-financed Point Lookout’s acquisition in 2005. I don't have any data on CS gas, but what I have on ammo *suggests* that the Czech round was exported in May or August 2011. Lots of other countries have also exported to Egypt in 2011.